I.A.O MEETING WITH DELEGATION OF THE COUNCIL OF THE EVANGELICAL LUTHERAN CHURCH IN DENMARK. 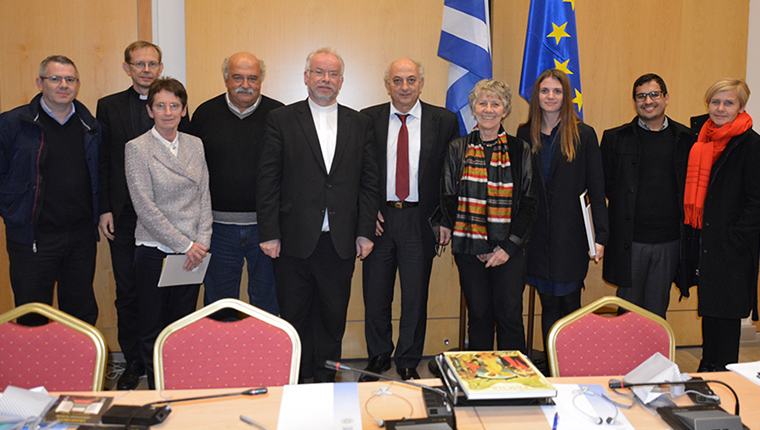 A delegation of the Council of the Evangelical Lutheran Church in Denmark realized a solidarity and briefing visit to Athens on Monday, 7 December 2015. The delegation was consisted of the Archbishop of Copenhagen Peter Skov-Jakobsen, Ms. Metter Boch, Member of the Parliament of Denmark, Ms. Karen Johanne Klint, Member of the Parliament of Denmark, Rev. Niels Nymann Eriksen and Rev. Margrete Auken, Member of the European Parliament from Denmark. The delegation was accompanied by Mr. Dan Biswas and Mr. Kenneth Brant Hansen from the center “Faros” for the support of refugee minors, seated in Athens since 2014. The Secretary General of the Interparliamentary Assembly on Orthodoxy (I.A.O.) Mr. Ioannis Amanatidis, along with the I.A.O. Advisor Dr. Kostas Mygdalis briefed the members of the delegation about the I.A.O. activities and initiatives regarding issues of political intervention, worldwide, in order to achieve political and religious understanding among different groups, political parties, social aggregations etc. Moreover, the delegation was briefed on the acute humanitarian problems, which are also caused due to migration crisis. The I.A.O. Secretary General stressed the imperative need for dialogue among politicians, religious leaders and young people. The Archbishop of Copenhagen expressing his views on the aforementioned issues, made use of the expression “If there is no peace among religions, then there is no peace among the peoples”. He also proposed a future cooperation between the I.A.O. and the Parliament of Denmark. At the end of the meeting, commemorative gifts were offered, as well as I.A.O. publications related to the organization’s activity, the financial crisis and the upsurge of political and religious extremism crisis. This entry was posted in Featured News, News and tagged Advisor Dr, Denmark, Karen Johanne Klint, Margrete Auken, Metter Boch by Orthodoxy Cognate PAGE. Bookmark the permalink.